A U.S. Navy destroyer reportedly entered waters near Syria shortly after President Donald Trump promised to make a “major decision” Monday on whether to order airstrikes against Bashar al-Assad. 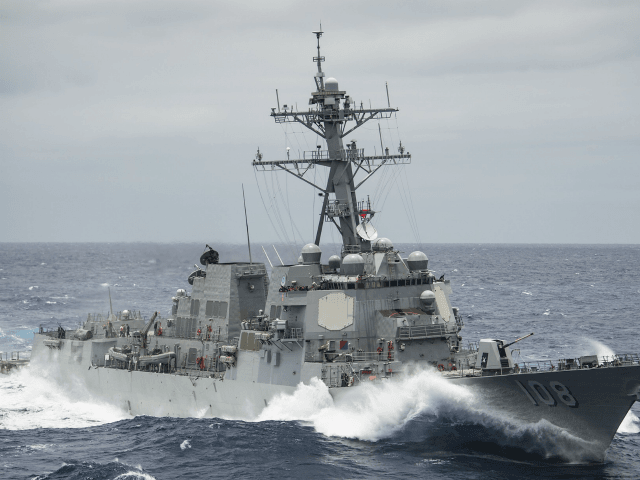 The Associated Press reports that the USS Donald Cook is now closing in on Syrian shores, armed with the same Tomahawk cruise missiles the U.S. used on a Syrian airfield last year after an alleged sarin gas attack on civilians. Trump is now mulling the possibility of additional airstrikes after Assad reportedly ordered a chemical weapons attack outside Damascus that killed dozens of people and left others in excruciating pain. Some politicians are also urging British Prime Minister Theresa May to help the U.S. destroy Syria’s chemical weapons resources, as she is expected to chair a national security council meeting on Wednesday to discuss the United Kingdom’s response. Russia, meanwhile, has warned of “grave repercussions” if Syria is attacked, and has denied all analyses claiming that Assad was behind the use of chemical weapons. “Through the relevant channels we already conveyed to the U.S. that armed force under mendacious pretext against Syria — where, at the request of the legitimate government of a country, Russian troops have been deployed — could lead to grave repercussions,” said Russia’s ambassador to the United Nations, Vassily Nebenzia, on Monday. Despite campaigning on a pledge of avoiding unnecessary military conflicts, this would be the second round of strikes against the Assad regime in response to another chemical weapons attack that killed hundreds of people Khan Sheikhoun.